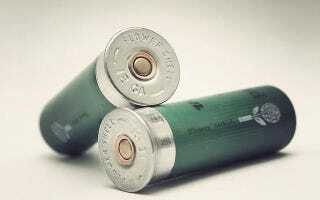 For all the hubbub about California banning the use of lead in ammunition, there's been less of a focus on safer alternatives—but designer Per Crowell has taken this to perhaps its most tongue-in-cheek extreme, proposing shotgun shells filled with seeds. The project website appears to take its mission quite seriously, suggesting that these are shells of life—future landscapes just waiting for their explosive birth somewhere. Indeed, the designer writes (sarcastically?) that this is a product he "worked really hard with for a long time" ("This is my dream project," he adds), but it's hard to take this seriously as anything more than an interesting art project, a satirical kind of gardening-by-gun, one that finds an unexpected landscape-production method in our everyday tools of hunting and violence. Each kit of these specially-seeded shotgun shells comes with 12 different species: Poppy, Sunflower, Peony, Daisy, Cornflower, and, ahem, Columbine, among an assorted of "meadow flowers." But the question shouldn't be: is this project an actual attempt, as the website claims, to "turn your 12 gauge into a life giver instead of a life taker"? The real point, I would say, is simply to reveal—even if comically, ironically, or through outright absurdity—the overlooked creative potential of otherwise violent tools. The canisters are dropped from a low-flying plane, so that they hit the ground at 200 m.p.h., and imbed themselves in the soil. Then the canisters decompose and the young trees take root. A large aircraft could drop as many as 100,000 saplings in a single flight: Alamaro's system could plant as many as a million trees in one day. The take-away? Repurposed armaments can be used to seed new landscapes. If even heavy bombing runs can, in fact, be reforestation efforts in disguise, why not a guy out walking the perimeter of his ranch with a shotgun? He just planting a future thicket. Fire these flowershells into the ground—and come back with your children to watch new gardens grow. In any case, does Per Crowell's project mean we'll all be gardening by shotgun? Of course it doesn't. Think of it as just an interesting and equally militant variation on so-called "seedbombs," those fake-ecofriendly tools for spreading non-native species that are now so common you can actually buy them from vending machines. Perhaps next decade, then, at a gun shop near you, you can pick up a few landscapes-in-a-shell on your way out the door; just don't try to protect your home with them.